EL SEGUNDO, Calif.–(BUSINESS WIRE)–Beyond Meat® is expanding its footprint in the meat-centric state of Illinois with distribution of its revolutionary Beyond Burger® in the meat section of 200 Jewel-Osco grocery stores. The ground-breaking burger’s retail expansion in Chicago is a historic moment for Beyond Meat as Illinois will now be the third largest grocery market for the brand, behind California and Washington. As a testament to the swelling demand, Epic Burger, Beyond Meat’s first restaurant partner in Chicago, sold over 20,000 Beyond Burgers across 8 locations since launching in July. That equates to 10% of Epic Burger’s sandwich and burger sales. The typical veggie burger (made with pea protein) makes up just 1% of such sales for burger chains that provide the option. What accounts for the difference is The Beyond Burger’s appeal to meat-lovers who seek to incorporate delicious plant-based options into their diet. Beyond Meat’s rapid retail growth is coupled with major food service/restaurant wins, including an exclusive partnership with Sysco that, since launching in September, has produced 2,000 new food service outlets carrying The Beyond Burger. This includes restaurants, hotels, college campuses and professional sports teams’ training camps. Many of these restaurants are innovative, single-unit restaurants like Delilah LA, The Moonlighter in Chicago, The Distillery NYC and The Hamilton Inn in Jersey City, that seek to appeal to meat eaters and vegetarians alike by offering innovative, plant-based options. 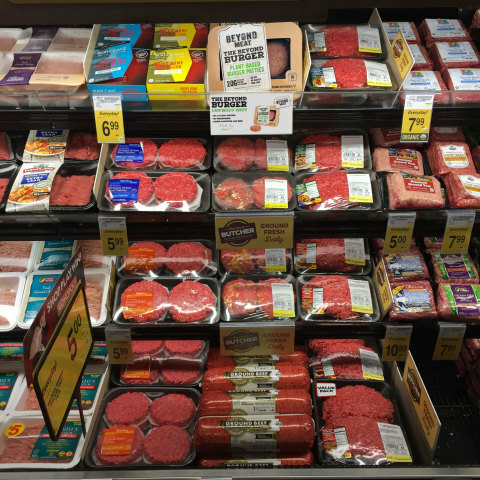 For the latest list of stores carrying The Beyond Burger, visit The Beyond Meat blog. The Beyond Burger is the world’s only burger that looks, cooks, and tastes like ground beef from cows but is made entirely from plants, without GMOs, soy, or gluten. The Beyond Burger packs more protein and iron than beef and is a cholesterol free food, with less saturated fat than beef. A 1/4lb Beyond Burger sold in grocery stores has 4 grams of saturated fat and 22 grams of total fat, compared to 9 grams of saturated fat and 23 grams of total fat in a 1/4 lb 80/20 beef burger. Based in Los Angeles, California, Beyond Meat is a privately held company with a mission of building meat directly from plants. Investors include Bill Gates, actor and activist Leonardo DiCaprio, Twitter co-founders Biz Stone and Evan Williams, Kleiner Perkins, former McDonald’s CEO Don Thompson, Honest Tea founder Seth Goldman, Humane Society of the United States, and Tyson Foods. To stay up to date on the latest, visit www.BeyondMeat.com and follow @BeyondMeat, #BeyondBurger and #FutureOfProtein on Facebook, Instagram and Twitter. Impossible Foods, a company backed by Bill Gates that promises to make veggie burgers palatable for carnivores, has secured distribution from top US restaurant suppliers in deals that will test the ambitions of Silicon Valley start-ups to disrupt America’s meat industry. Venture capitalists have embraced California-based food tech start-ups, like Beyond Meat and Memphis Meats. Impossible Foods alone has raised $273.5m from investors including Google’s venture capital arm, Khosla Ventures and Temasek Holdings.